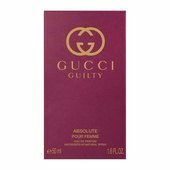 The #GuiltyNotGuilty revolution continues with Gucci Guilty Absolute Pour Femme Eau de Parfum, the ultimate partner for Gucci Guilty Absolute Pour Homme. Together, the Absolute couple express the notion of emancipated love, a pair of fragrances that complement one another as a journey of liberation. Beginning from a mysterious note of blackberry, Gucci Guilty Absolute Pour Femme is a non-traditional women's fragrance created for a contemporary woman. There is no one absolute way to wear fragrance. There is no one absolute way to love. There is no one absolute way to connect.